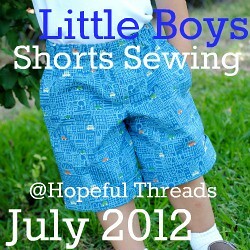 I have been making shorts for Hopeful Threads July Project, little boys shorts. I dug into my fabric stash to use my fabric on hand including scraps and short cuts of fabric. In some cases I found that I didn't have enough fabric for side pockets. Now we all know that little boys love their pockets. Where else would they put their rocks, sticks or whatever else they find laying around. I used some scrap fabric to add a simple cargo pocket. I didn't use a pattern so I thought I would share with you the formula I used to make the pockets. I took this idea from a pair of shorts my son has. First you need to decide the size of your pocket. Add 1/2 inch to the sides and bottom of the pocket and 1 inch to the top. Cut the flap 1/2 inch wider than the pocket piece and 2 1/2 inch tall. finish the edges all around. Fold down the top edge 1 inch, right sides together. Sew down the top edge 1/2 inch in on the sides. Trim seam to get rid of bulk. Turn right side out and fold in sides and bottom 1/2 inch. Open the seam and fold the corners in diagonally. Fold the seams back in to create a nice corner. Pin the pocket to the front and back side seam. Sew two rows of topstitching. To create the flap fold piece in half, right sides together. Sew side seams using a 1/2" seam. Pin down 1/2 inch from the pocket and sew down using 1/4 inch seam. Fold flap down and stitch the top edge. The shorts pattern is Mud Puddle Splashers by Fishsticks. I made these shorts for Hopeful Threads July project, little boys shorts for Cambodia. It's not too late to participate. Check out her blog for details. These shorts look great with the cargo pocket. Thanks for sharing your easy to follow tutorial.